I think the current version of FixedHeader is 3.1.4, which should be working fine. If you're having a problem, we're happy to take a look, but it would help if you could link to a running test case showing the issue so we can offer some help. Information on how to create a test case (if you aren't able to link to the page you are working on) is available here. I am using datatable with below code and it works fine with paging filter and all. Please guide how to use this fixed header feature with top text box filter option on datatable. If not then please provide a test case replicating the issue. Please note that as i change the css for table.dataTable tfoot to "display: table-footer-group;" then fixed header works fine but input box goes on footer which i dont want. You will need to follow this example to have the column searches in the FixedHeader. This is due to the way FixedHeader is structured. Please try changing your example to use this code. Thanks for the example. As your example works fine. I have checked it and it also work fine with me when i am using static data. But i am using data from server side to bind Datatable. So when i was trying to code with same way ;like you did but is not working. So can you pls give an example with server side data bind where Fix header works with search textbox on header and column visibility feature. As I said above, the best way to progress this would be to provide a test case that demonstrates the problem. pls give an example with server side data bind where Fix header works with search textbox on header and column visibility feature. 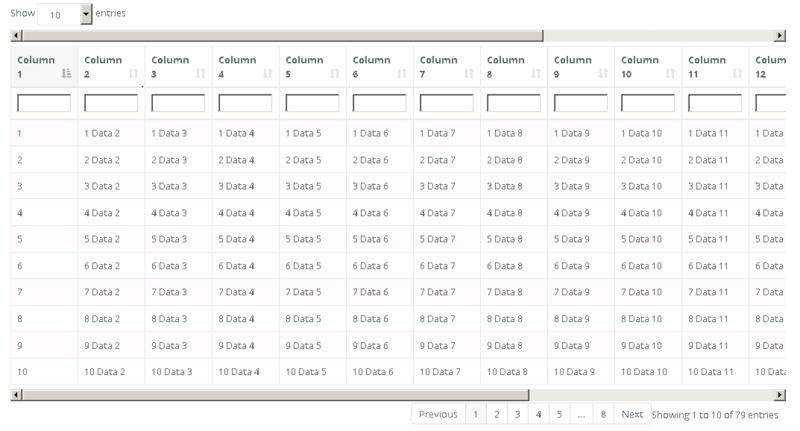 Here is that example with server side processing, fixedcolums and hidden columns. Please update or provide a test case replicating your issue so we can help. Thanks for the example. As your example works fine, but in your example grid was bind on page load and i need grid will bind on button search click, when i place your code on button search click on your example than searching was stopped. Please provide me example on button search click grid bind with search functionality.